For those of you who love the TV series "Chuck," it first aired nine years ago today! I enjoyed "Chuck" so much that I wrote a book serving up career and business tips from the show. Would love to see a Netflix-like return of "Chuck." Excerpt from "Chuck" vs. the Business World - Who Works for You? Employees are both the backbone and the ambassadors of any business. So, the importance of having the right people can in no way be overestimated. And that’s not just about employees with certain skills, but with solid character and strong work ethics as well. In contrast, the wrong employees mean that your business can suffer or even go under. The Buy More in Chuck regularly serves up examples of the wrong people for the job. While episodes of Chuck make the point with humor, it’s extremely frustrating to deal with employees who have little, if any, interest in doing their jobs, never mind the notion of more broadly looking for ways to make the firm more successful. Unfortunately, there always seem to be workers who will find excuses to avoid pitching in when extra work must be done. Others rebel against almost any kind of authority. For good measure, there is the question of employees who cannot be trusted to carry out tasks independently. Business owners and managers cannot afford to simply assume that all employees possess the positive attitudes and motivations needed for business success. Quite simply, all workers do not have the same outlook regarding their jobs and the business as do the owners and managers. To grasp this reality, contemplate the role of labor unions in business history. A union considers the well being of the business only if the firm’s survival is in immediate jeopardy. Just take a look at the troubles of unionized auto manufacturers. The objective of labor unions is to maximize compensation for union members, while minimizing the amount of work needed to earn such compensation. While labor unions are nearly inconsequential in the private sector today – in 2010, only 6.9 percent of private sector workers were union members, compared to 24.2 percent in 1973, for example, according to Unionstats.com – labor union leanings or thinking among certain workers certainly has not completely evaporated. Management must evaluate each employee, and gauge just how much oversight is required. This assessment is necessary not just to maintain or boost the productivity of a particular worker, but also to make sure that such an individual does not negatively affect other staff. After all, it is not necessary to take over and barricade the workplace to undermine management and a business. Indeed, undermining owners or managers is accomplished far more subtly, through complaining at desks or around the water cooler, for example. If left unchecked, those negatives can serve as a drain on an entire department or business. Indeed, when employees go so far as to actively show that they have no real interest in work or the business, quick and decisive action by management is required. Otherwise, again, the department or business will suffer. Initial actions taken hopefully will be corrective, guiding the worker back on the right track. But if problems continue, then there must be increasingly severe responses, ranging from reprimands to suspensions to, if necessary, firing the worker. Unfortunately, Rye, using the real threat of immediate death to get the Intersect working, winds up getting shot and dying himself. When sitting down to write a novel, I basically know how the story is going to end. In the world of television, however, very few creators of shows know how the story will end. In the larger business world, entrepreneurs should at least have a goal as to how they see their enterprise concluding, or perhaps how their own role in the business will finish. It was the two-hour finale of NBC’s “Chuck” on January 27 that got me thinking about how various commercial endeavors end. Those involved in creating and telling the story of “Chuck” actually were kind of lucky. Not in the sense of being cancelled, of course, but they were lucky to know when the end was coming, being granted a 13-episode run in its fifth and final season. As a result, the tale on each of the show’s characters could be wrapped up. That, of course, is pretty unique in the television business. Just think of the end of “Las Vegas,” which was cancelled after a cliffhanger episode. How frustrating is that for those making the show and for viewers? As for the “Chuck” finale, it was done right, with heart, action, and humor - all of the traits that made the show a favorite for so many devoted fans. In fact, few television series have ever finished the way “Chuck” did, with so much of the final two hours harkening back to the very start of the series and, therefore, very much being dedicated to the most faithful fans. In one’s business and career, to go out on your own terms is the ideal. Of course, life and the marketplace often make that a real challenge. But both business owners and employees should set goals, make plans, and be prepared to adjust as time passes. Some key questions must be pondered. For entrepreneurs: Do you plan to sell the business one day? Will the enterprise be passed on to a family member? If a partnership, are there special criteria to be agreed upon if the partners decide to go separate ways? And for both business owners and employees: Is this what you want to do for the rest of your career, or are other ventures possible? What is your risk level at various points in life? Are you planning to retire, and if so, what are your retirement expectations? As the market and your business change, it is important to recognize that goals and strategies will need to be adjusted, or perhaps even the end of your business story will have to be re-written. But keep in mind the examples of “Chuck” and “Las Vegas.” Namely, you want the business to end on your terms. You certainly do not want to be left with some kind of unfulfilled cliffhanger beyond your control. Ray Keating is the author of “Chuck” vs. the Business World: Business Tips on TV (available at Amazon.com). He also is an economist, weekly newspaper columnist, adjunct college business professor, and novelist. Long Island, NY – Ray Keating is the author of the recently published “Chuck” vs. the Business World: Business Tips on TV. In this fun and insightful book, Keating illustrates that TV spies and nerds can provide insights and guidelines on balancing work and personal life, managing workers, customer relations, leadership, trust, job interviews, technology, hiring and firing people, and career goals. “Chuck” vs. the Business World: Business Tips on TV can be purchased from Amazon.com for $7.99 in paperback or $1.99 for the Kindle. The link is http://www.amazon.com/Chuck-vs-Business-World-Tips/dp/1466345713/ref=sr_1_1?s=books&ie=UTF8&qid=1316819971&sr=1-1. 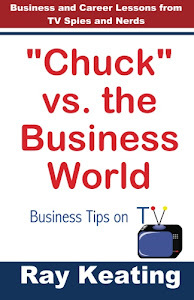 Visit the “Chuck” vs. the Business World: Business Tips on TV Facebook page at http://www.facebook.com/ChuckBizWorld. Also, more information and updates are available at http://www.businesstipsontv.com. Ray Keating is chief economist for the Small Business & Entrepreneurship Council; a weekly columnist with the Dolan Company (including Long Island Business News and Colorado Springs Business Journal); a former Newsday weekly columnist; and an adjunct professor in the MBA program at Dowling College. Keating also is a novelist, penning Warrior Monk: A Pastor Stephen Grant Novel (2010). It’s hard to imagine two managers more different than Big Mike and General Beckman. For example, Beckman stands willing to make the tough call or seize control of the situation when necessary. In contrast, Big Mike’s gut tells him to avoid tough situations and hide in his office. And while both Beckman and Big Mike recognize the need for their employees to succeed, Beckman sees that the growth of her employees will build the organization and help to meet the firm’s mission. Big Mike only sees his own benefits. For example, Beckman compliments Chuck for his tactical thinking that advances the mission, while Big Mike gives a thumbs up to Lester for having the managers-only doughnuts ready, while the store is without workers. In the end, Big Mike misses the fundamental point that managers lead by example. In his actions and declarations, Big Mike makes clear that he does not care about his job or the Buy More; is uninterested in hard work; and has no eye for detail in terms of what’s going on in his store. That being the case, should he expect anything more from his employees? Of course not. As Lester says, Big Mike serves as an inspiration to all slackers. Psych: How Far on Honesty with Co-Workers?